Our names are Samantha and Stacey and we’re carb-a-holics. We’re not afraid to admit it, either! What’s better than a gently fried egg with cheese atop a lightly buttered plain bagel? Well, a pumpernickel bagel with cream cheese and lox, of course! That was the inspiration for today’s photo. Stacey craved each one, so she went for half and half. It filled her belly for most of the day, too. Samantha explains how this delicious meal enjoyed every so often is actually a pretty healthy choice. Carbohydrates – we love them, but some folks love to hate them. They’ve been the subject of much debate and their reputation has been needlessly tainted over the years. While their sales may be impacted by the ups and downs of the diet world, carbohydrates continue to be important to overall health and can be included in a balanced dietary routine. As carbohydrate-rich foods go, the bagel is near the top of the “avoid” list for many dieters and would-be healthy eaters. It’s true, their serving size has increased, and many bakery style bagels can easily pack several servings into one round and chewy breakfast staple, but we believe that every food fits in a balanced diet. Our natural requirement for carbohydrate remains, and using wise portions, bagels can fit into your plan. Think of an average bagel as about the same size as a hockey puck, about 3 inches in diameter. Some brands of frozen bagels are this size, whereas a bakery bagel is typically larger. Keep in mind that one whole bagel – of the hockey puck size – satisfies two servings from the grain group. That leaves you with about 4 additional grain servings for the day, depending on your total calorie intake. If you’re conscious about making half your grains whole, there are plenty of whole grain bagels to satisfy. Be on the lookout for “whole grain” not simply “multi-grain” or “wheat.” You may need to check the ingredient list. 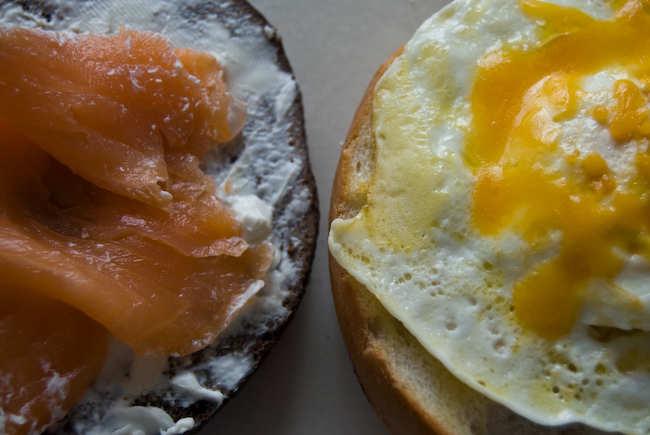 Stacey’s breakfast choice also included egg and lox – two fantastic protein sources to incorporate at breakfast. Many of us could use more protein at breakfast to keep from hitting that mid morning slump that causes us to reach for a vending machine snack. Protein keeps us satisfied longer, and combined with carbohydrate and fat, it’s a well-rounded breakfast choice. Every so often, full-fat spreads provide extra flavor, but on this day, Stacey opted for a healthier yogurt-based butter and reduced-fat cream cheese to cut down on fat and calories. How Stacey got the shot: On the dining room table with the digital, mid-morning light coming through the windows. ISO 400, focal length 40 mm, aperture f/5, exposed 1/80 second. Thanks for joining us this week, and until next Thursday, happy eating! Had Your Vitamin C Today? Janina, thank you for your compliments! We are thrilled that you enjoy the blog and the photos that go with it. Whether sprouted grains do in fact pack more of a nutritional punch remains to be seen. There is not much literature available to support the claim that they are nutritionally superior to other whole grain choices. There is a school of thought that sprouted grains have a higher fiber content and may have other vitamins and minerals in higher quantities due to the way they are grown. Much of this thinking comes from proponents of raw food diets. In general, choosing whole grains – and sprouted grains are recognized as such – is a wise move. The Dietary Guidelines for Americans, established by the U.S. Department of Agriculture – recommend making half your grains whole, so that leaves plenty of room for sprouted grains, whole wheat cereals, rye bread, or your personal favorite whole grain. When it comes to whole grains, my bottom line recommendation is to read the ingredient list.